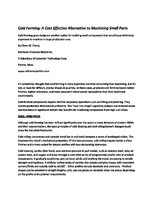 RF and Microwave Modules facilitate rapid prototyping. Featuring fully integrated, hermetically sealed design, HMC Series Modules shorten proof-of-concept phase of design cycleÂ and help minimize overall in-house technical support needed to assemble, test, and validate design. Series includes: HMC-C582 ultra-wideband power amplifier module ranging from .01–20 GHz; HMC-C583 single pole single throw switch module ranging from 0.1–40 GHz; HMC-C584 0.1–40 GHz, 31 dB, 5-bit digital attenuator module; and HMC7891 2–18 GHz limiting amplifier module. NORWOOD, Mass.--Analog Devices, Inc. (ADI) today introduced four high performance RF and microwave standard modules that extend and strengthen its standard module product portfolio. The new modules complement ADI’s existing product offerings by delivering easy-to-use, fully integrated, hermetically sealed solutions that dramatically shorten the proof-of-concept phase of the design cycle and help reduce the overall in-house technical support needed to assemble, test, and validate a design. 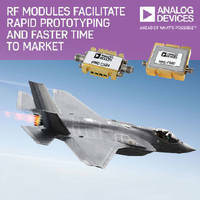 Analog Devices offers the largest and most diverse portfolio of RF and microwave modules available on the market today. Unlike many other module manufacturers, ADI uses its own Monolithic Microwave Integrated Circuits (MMICs) in each module, which guarantees consistent high quality, reliability and performance in any application. Analog Devices (NASDAQ): ADI) designs and manufactures semiconductor products and solutions. We enable our customers to interpret the world around us by intelligently bridging the physical and digital worlds with unmatched technologies that sense, measure and connect.